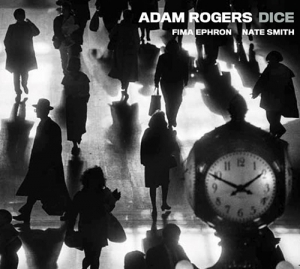 Modern jazz virtuosity combusts with a raw, eclectic mixture of rock, funk, blues, country and R&B in a volatile combination that uniquely reflects our time while evoking the gritty street sounds of a bygone New York on the self-titled debut release by Adam Rogers' DICE. The explosive power trio brings together Rogers, one of the most acclaimed and inventive guitarists in modern jazz, with a pair of longtime collaborators: bassist Fima Ephron and drummer Nate Smith. Together, these three adventurous artists have created a uniquely electrifying sound that merges danger-skirting experimentalism with blistering, genre-defying tunes and spontaneous grooves as tightly coiled as a rattlesnake about to strike. It's a singular concoction, one that could only come from a musician with Rogers' distinctive background and gift for uniting six-string wizardry with gut-churning propulsion. Due out June 16 on Rogers' own ADRAJ RECORDS imprint, DICE marks the first release on the guitarist's new label as well as the debut of a trio that has been honing its visceral sound for the better part of a decade. The members have shared histories that date even further back, however; all three have been key members of Chris Potter's Underground, while Rogers and Ephron have co-led the uncategorizable group Lost Tribe since the early 1990s. "The music that we play in this band is so infused by Fima and Nate's incredible capacity to really groove their asses off, regardless of how complex the music can become." Rogers says. "They have a phenomenal hook-up, both in terms of their natural talents and their ability to objectively conceptualize music." Those qualities are key to the risk-taking approach of DICE, which uses the written material as the leaping-off point for powerfully infectious music created entirely in the moment. It's composition as a roll of the dice. Rogers' formative years were spent on the streets of New York City at a time when a staggering range of music poured out of every house you passed by. He was surrounded by music in his own home, where both his parents were Broadway performers who raised him against a steady backdrop of show tunes, jazz standards, popular song and opera. He came of age captivated by everything from The Beatles to James Brown, The Temptations to Led Zeppelin, Parliament Funkadelic to Jimi Hendrix. He discovered jazz through fusion pioneers like Herbie Hancock's Head Hunters and Weather Report before tracing the music back to its source, finding inspiration in the music of Charlie Parker, Miles Davis and John Coltrane. "In New York in those days," Rogers recalls, "radios were always playing everywhere, right out on the street. I was profoundly affected by that; the music I heard cast a spell on me when I was young. There was so much instrumental musicianship evident in all of that era's popular music, which, combined with what I heard at home, ultimately created the musical groundwork for me to start to appreciate jazz."